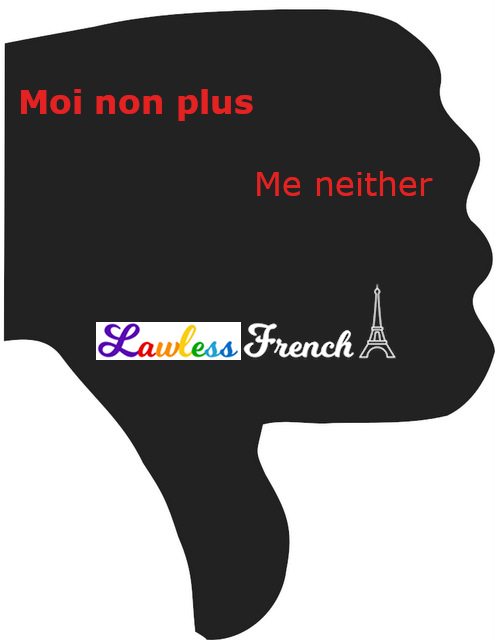 Usage notes: Moi non plus is the opposite of moi aussi. They both agree with what someone just said, but moi aussi (me too) agrees with an affirmative statement, while moi non plus (me neither) agrees with a negative statement. – Je n’aime ce film. – Moi non plus. – I don’t like this movie. – Je n’aime pas ce livre. – Moi non plus. – I don’t like this book. The stressed pronoun moi can be replaced with any other stressed pronoun to indicate another person’s agreement with a negative statement. – Il n’aime pas ce film. – Nous non plus. – He doesn’t like this movie. – Elle n’aime pas ce livre. – Eux non plus. – She doesn’t like this book. – Ma fille n’aime pas ce jeu. – Mes enfants non plus. – My daughter doesn’t like this game. – Neither do my kids. – Je ne veux pas y aller. – Isabelle non plus. – I don’t want to go. – Non plus. – I don’t want to go. – And Thomas? What about Thomas? – Him either (he doesn’t want to go either). Nous n’aimons pas ce jeu non plus. We don’t like this game either. Il ne veut pas y aller non plus. He doesn’t want to go either.